It seemed out of character for Cowboys coach Jason Garrett to so quickly blame Tony Romo for a critical mistake following Sunday’s loss to the Packers. 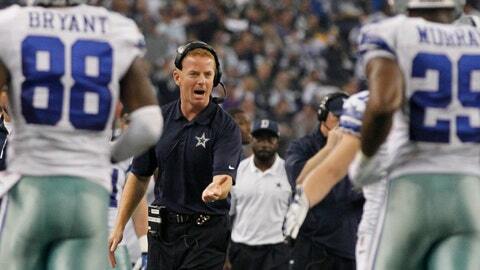 "Yeah, we coach Tony," Garrett said after a long pause. "We coach Tony just like we coach everybody else. We coach Tony with positive reinforcement and with negative reinforcement. We coach everybody on this football team. "There were a lot of good things in that ballgame, there were some things that weren’t so good. It’s our job as coaches to make sure he understands that, just like every guy on our team, and we make the corrections and move forward." "The biggest thing is they took the safety out of the middle and there literally were 11 guys on the line of scrimmage," Garrett said. "When I say ‘on the line of scrimmage’ [I mean] very close to the line of scrimmage." "You could see why he viewed that as an unfavorable [run] look," Garrett said. "But having said that, you hand the ball off and you move on to the next one. We deal with the third down situation and you force them to use their timeout, all of that stuff. " "I think he’s going to bounce back well," Garrett said.